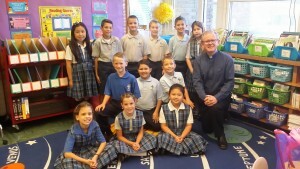 John Paul II Catholic School is a regional school of the Archdiocese of Detroit. 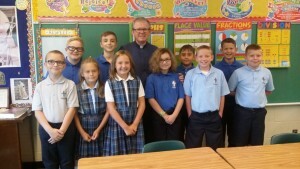 JPII is supported by Christ the Good Shepherd Parish in Lincoln Park, and the Wyandotte parishes of Our Lady of the Scapular and St. Vincent Pallotti. Deposit bottles and cans in the container in the hallway by the St. Joseph Church Hall. Proceeds go to help cover expenses for the 8th Grade Trip to Washington DC. 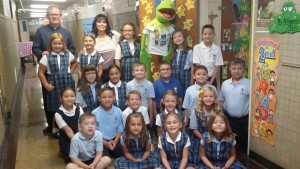 At John Paul II Catholic School, our goal is to support families in the education and faith formation of their children. We are committed to help children grow in their understanding and love for God. We strive to help children learn about the world around them and to develop the skills that are necessary to succeed in today’s world. Together, the three parishes are united as a community of Faith, all working toward a shared goal that celebrates and incorporates the rich ethnic heritage of these sponsoring parishes. 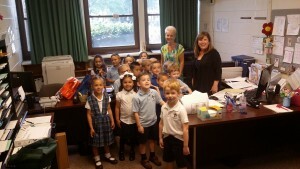 Another academic school year has started at our Parish school! Mrs. Lupinacci and the wonderful teachers at JPII welcomed the students and parents with warm smiles…and lots of hugs! The first school day began with the 8th graders leading the school in prayer. Students were busy learning new routines and getting to know their new teacher and classmates. Fr. 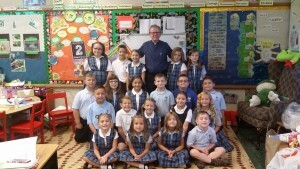 Mike also visited each class to wish a happy school year. Truly a great start for our John Paul students!